I had a rough idea of what to expect as we turned onto a narrow dirt road and jounced and bounced along the rough track, dodging potholes and cars, small children and other obstacles. I love discovering the real Cambodia — and it is so much better when there is a local to show you around. The teacher I help with conversational English classes invited me to visit his village and his home. He picked me up one Wednesday morning and I climbed on the back of his motorbike and we headed out Road Six towards the airport. There’s certainly nothing special about Road Six. It’s busy, it’s dusty and it lacks character. It’s also lined with countless big, flash hotels, screaming their presence ostentatiously to the world — a bizarre anomaly in a place where $100 is a fortune. The track we were bouncing along was only a few hundred metres from Road Six and the homes couldn’t be further removed from the four and five star luxury so close. But I doubt many of the people who stay in these hotels see this other side of life, a stone-throw from their plush accommodation. Sothy lives in what he calls a “sidewalk village”. 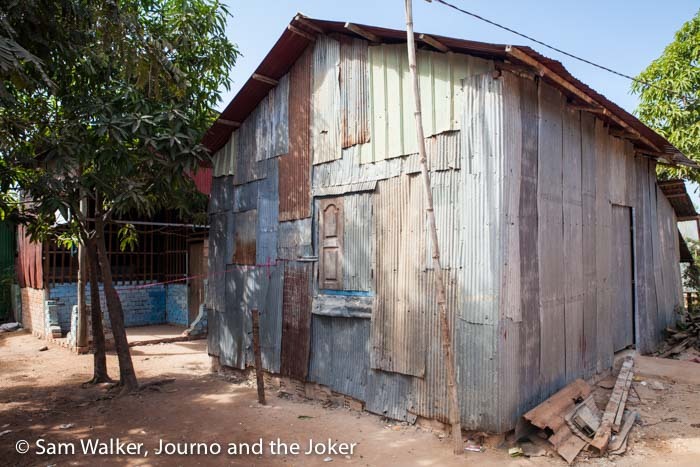 Basically, the narrow road is lined with tin shanties — their walls a patchwork of tin sheets. Most have no windows. Some have concrete floors. There’s no bathroom and the water comes from a nearby well. There is electricity but seemingly it’s at twice the going rate from places in town. Most are one room dwellings. The sun beats down relentlessly and a film of red dust covers everything. This is the real Cambodia. Sure, there are plenty of big houses around and an ever-growing middle class but the reality is most people are living hand-to-mouth and many live with their families in small villages like this. Sothy paid $250 for his home. He owns it. But the land is another matter. I suspect the government might own it, or possibly the landowners whose property these simple homes border. It makes life a little precarious. There has been talk the government might pull them down and move them on, leaving a community of hundreds with nowhere to go. At the time I visited he was supporting his wife and two children, his mother-in-law, brother-in-law and sister-in-law. But the family comes and goes and sometimes there are fewer living in the small space. Their home is spotless. His wife has everything in order. But Sothy was keen to walk me through the village. To show me life on these humble streets. Small shops on the side of the road sell cold drinks and snacks and all the things you expect to find at a corner store. Washing was hanging on racks lining the street, motorbikes are parked to the side. Children run and play and call “hallo” waving as we walk. It’s a social community and Sothy says his family will often join the neighbours for a party in the streets. Many of his neighbours do not have jobs. And too many of them send their children out onto the streets to work. Tiny little urchins are expected to collect cans and plastic bottles and forage in the rubbish for anything they can salvage. Some have been killed or injured by passing cars. Most don’t go to school. And this is Sothy’s concern. He wants to set up a school and teach English to these youngsters — at no cost. He is passionate about bettering those around him and especially giving the children opportunities for a positive future — a step up. An NGO used to operate a school in this little building and Sothy is hoping he can eventually get the support to open a school there again. But for the minute he lacks the time and the resources. He took me around a few streets until we reached the Kids Club. Run by White Doves Cambodia, it offers a small area where children can kick a ball and learn martial arts. 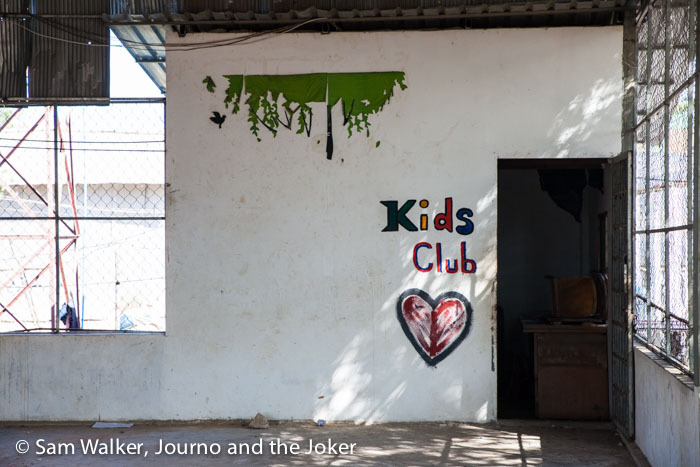 There’s also a day care facility attached with books, toys and games and a television. We wandered back to his house, to more cheerful waves and calls of hallo. And he and his wife invited me to lunch. A delicious meal that was definitely not curry — she made that quite clear. I’m hoping she will teach me how to make it. The real Cambodia is not on the main roads. 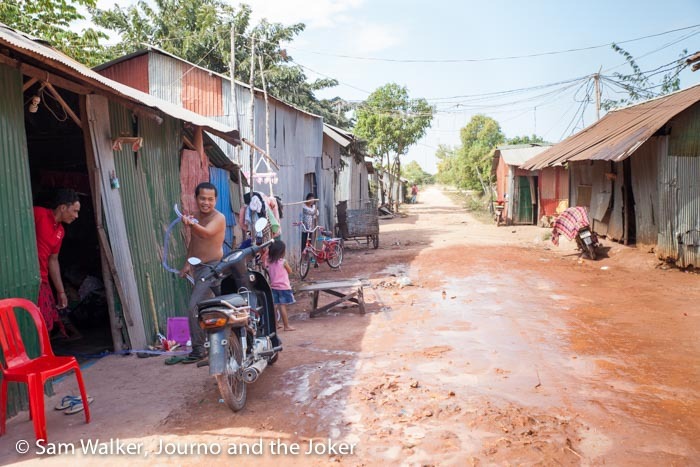 The real Cambodia is in the back streets and the little lane ways, down muddy tracks and winding paths. I know that is true of just about anywhere you visit. But here, I am constantly amazed at what I find when I venture just a little way off the main road. It was a delightful and enlightening morning. I loved Cambodia so much. The people were beautiful and so proud of their country. They really just wanted to share their culture and their experiences. It was a bucket list item for me and I cannot wait to go back. Hi Kacey. It’s certainly one of those countries that draws you back again and again. The people are just so beautiful.